I guess before the 2013 calendar year is over, I should probably show off some cardboard-related Secret Santa gifts. The gift exchange I participated in was hosted by Crackin Wax, and my Secret Santa sent me some great Cubs cards. 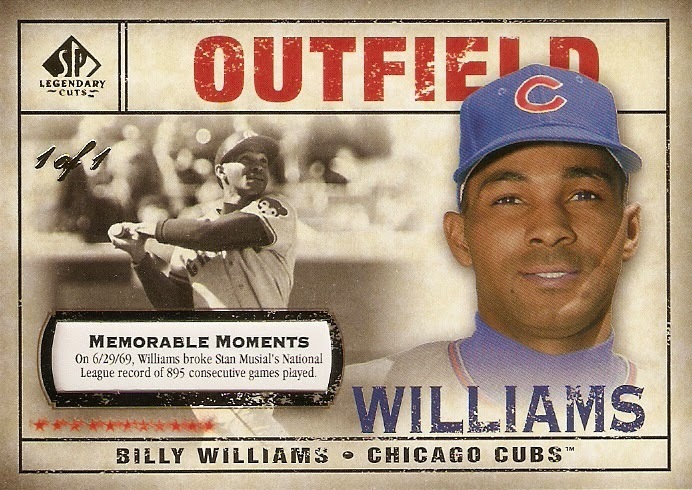 The first one is a 1/1 Billy Williams card from 2008 Upper Deck SP Legendary Cuts. 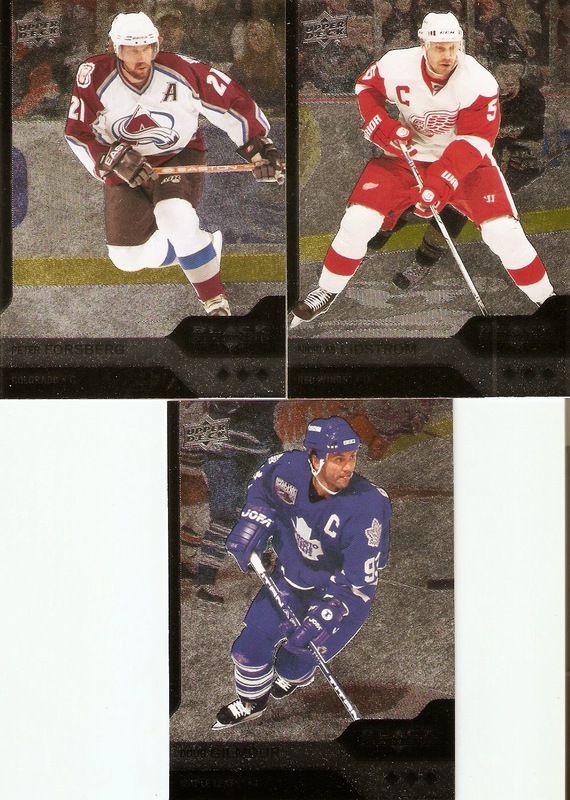 These Memorable Moments parallels are all numbered 1/1, and are inserted at a rate of two per case. Multiple cards of each player are issued, but what makes them 1/1s is the "Memorable Moment" featured on just this card. The moment on this particular card is from June 29th, 1969, when Williams broke Stan Musial's National League record of 895 consecutive games played. 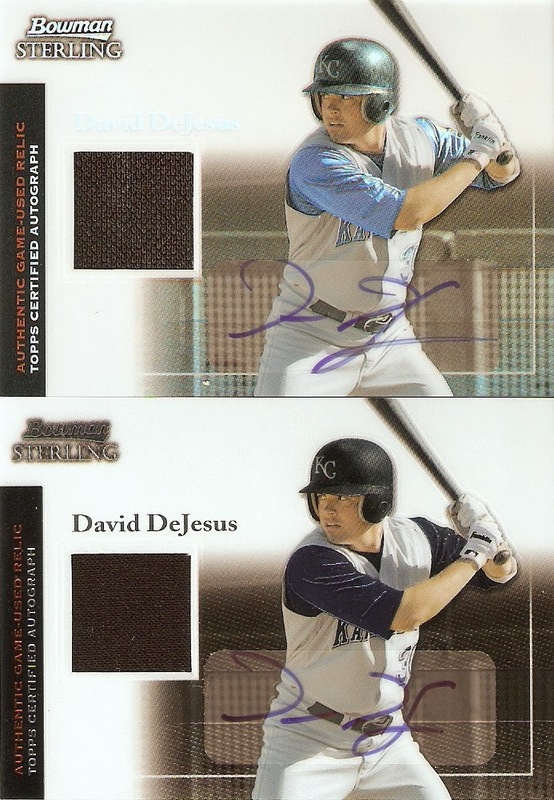 My other two card were of David DeJesus. Both are from 2004 Bowman Sterling and feature an autograph, as well as a jersey swatch. One is the base insert, and the other is the refractor parallel, numbered 125/199. DeJesus played from most of two seasons with the Cubs before being dealt to the Washinton Nationals this past August. Four days after that trade, the Nationals traded him to the Tampa Bay Rays, where he appears to be staying, as he just signed a two-year contract. I always liek these kind of exchanges, just because of the excitement of not knowing exactly what you are about to open when you get that manilla envelope in the mail. Anyway, here's to a great 2013, with hopes that 2014 is even better. 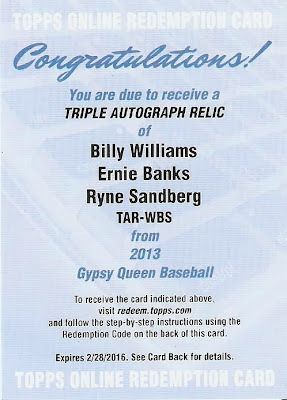 Sandberg/Banks/Williams Redemption: On Its Way!!!!!!! Okay, so earlier this month, I posted on a redemption that I was waiting on from Topps. 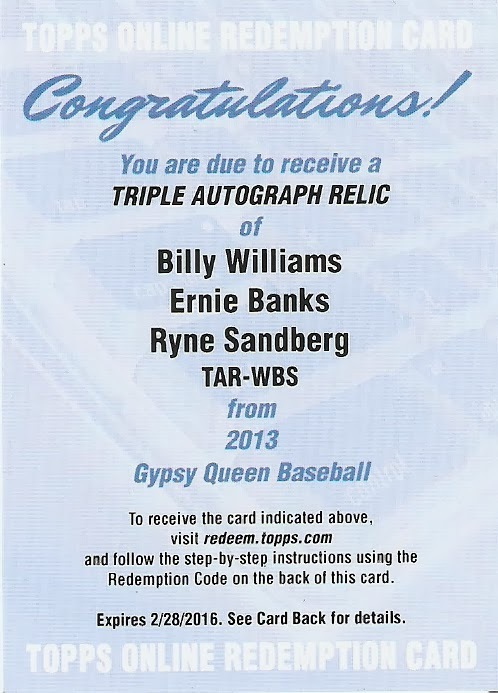 It comes from 2013 Gypsy Queen and is a triple autographed relic card of Chicago Cubs Hall-of-Famers Ryne Sandberg, Ernie Banks, and Billy Williams, numbered to 10. As it turns out, all of the components for this card, from the sticker autos to the memorabilia pieces, have been gathered. According to the tracking number left, the card should arrive some time this weekend, and I'll be sure to post it in all it gloriousness once I have it in hand. 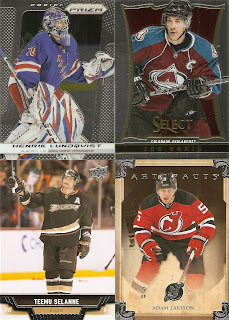 Here's the goods from a trade I just completed with Doug from Sportscards from the Dollar Store. Well, I say "just," but the trade actually happened a while back. I just haven't posted on it yet. Anyway, usually what he sends me are set fillers, which in past trades, have allowed me to complete more sets than I can remember. He sent some more, but he also threw in a few cards for my other collections, as well. 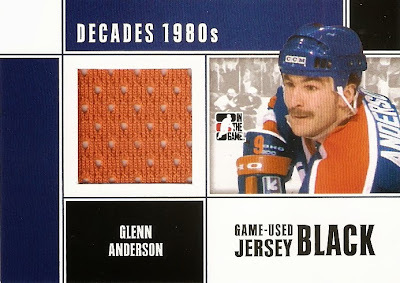 For my Hockey HOF Relic Project, I got a Glenn Anderson jersey card from In the Game Decades: 1980s. Anderson was one of a long list of eventual hall-of-famers from the 1980s Edmonton Oilers dynasty, which included Paul Coffey, Grant Fuhr, Wayne Gretzky, Jari Kurri, and Mark Messier. 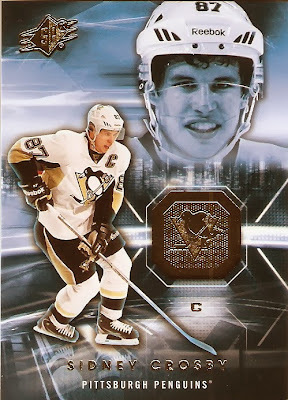 For my Sidney Crosby Collection, I got a card from Panini's 2013 Toronto Fall Expo Wrapper Redemption. 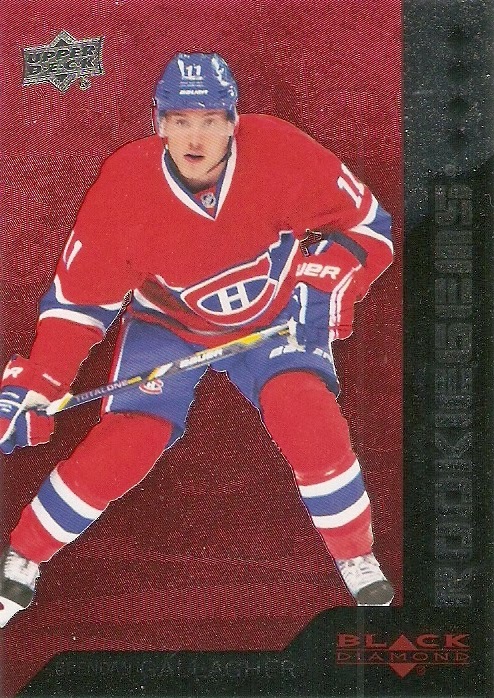 Living in the U.S.A., I don't get any access to these Canada-only cards, except on the secondary market, so it's nice to get one through a trade, instead of relying on Ebay. That's it for another great trade. 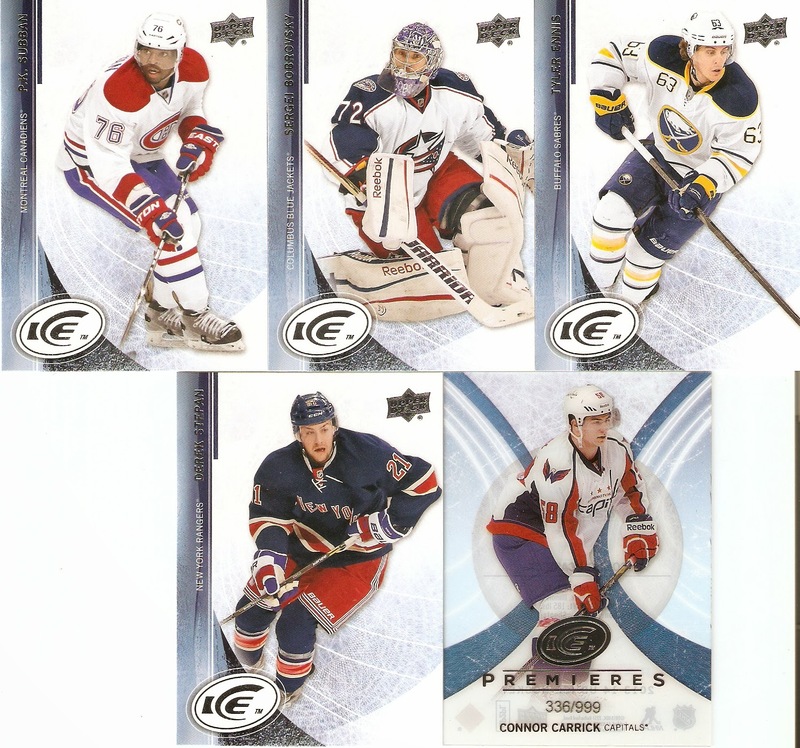 With all the 2013-14 sets out now, I'm sure there will be more not too far behind! I actually bought this box over a month ago, on Black Friday, but as you will see, the underwhelming contents left me in no rush to post it. This is actually my second box of 2013-14 Panini Prizm, with my first delivering a 1/1 Erik Karlsson and a James Neal auto. Based on what I had seen of other boxes being busted, I knew that I practically struck gold, as most just contain a rookie auto and a sticker dump auto, much like the one you're about to see. 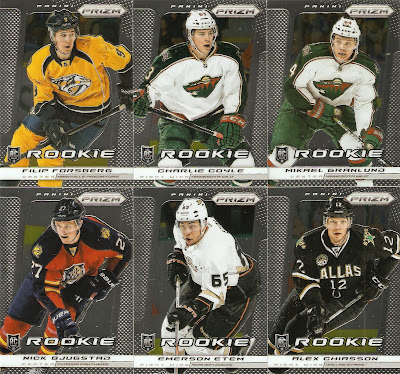 Now, I knew I wouldn't come close to matching the awesomeness of Box #1, but it was Black Friday, and I was looking for those Black Friday redemption packs, so I decided to go with it. It did help me somewhat with my set, though, so at least not all is lost. I just can't get enough of Prime, can I? Well, the truth is, I was hoping for a box of newly-reduced 2013-14 Dominion, but apparently the release date has been delayed yet again. It looks like I will have to wait until Jan. 3, so I decided to pick up the next big thing. Oh, sure, I suppose I could be patient, save my money, and have that much more to put toward Dominion, but who wants to do that? I may have a few good qualities, but patience is not one of them. So here we are, with my third box of prime, which contains a two-card pack of 2012-13 Dominion (So, I at least still get my Dominion fix). Seven cards. A bunch of hits. Autographs. Patches. Whatever else they decide to throw in. Each two-card pack of Dominion contains one base card. Now, this could be the regular base card, or a variation of it, like gold /25, emerald /5, or a 1/1 printing plate. I was lucky enough to pull one of those 1/1s, and of a pretty good player, as well. 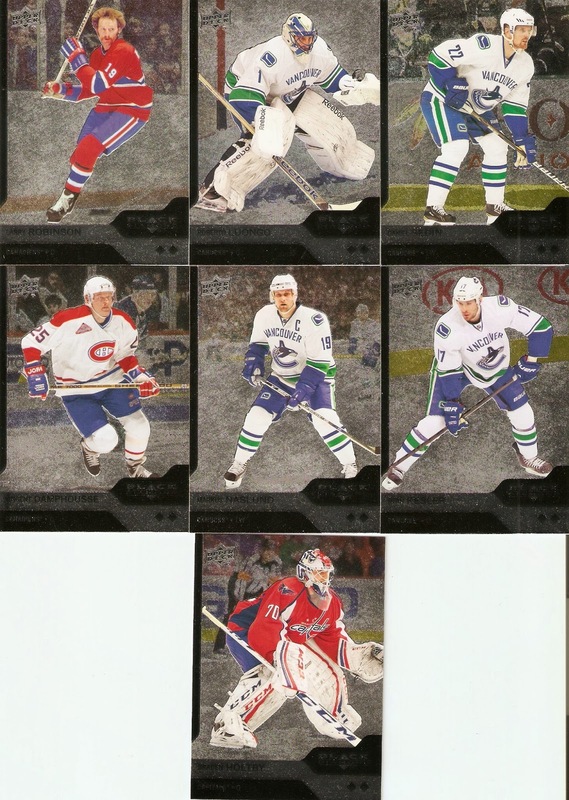 Here's a look at the card's backing. I love how Dominion puts an actual card back on the reverse side of the plate, instead of just slapping a sticker on it. The 1/1 designation is in the bottom left corner. 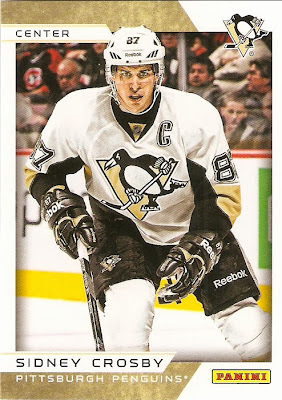 Now, as a Penguins fan, I hate the Philadelphia Flyers, but LeClair actually played in Pittsburgh for a couple years. 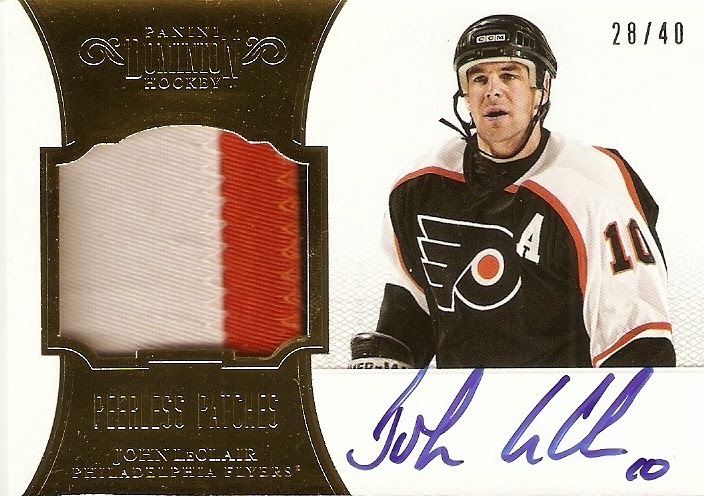 He won a Stanley Cup with the Montreal Canadiens in 1993, and spend most of his career in Philadelphia as part of their "Legion of Doom" line, but after the NHL introduced a Salary Cap following the 2004-05 lockout, the Flyers released LeClair. He then signed with Pittsburgh and had two fairly productive years, before ending his career in Dec. 2006. While I got a parallel for my Dominion base card, I just got the regular version out of my Prime pack. Still, you can't go wrong with Tavares. He was the first overall draft pick in 2009. 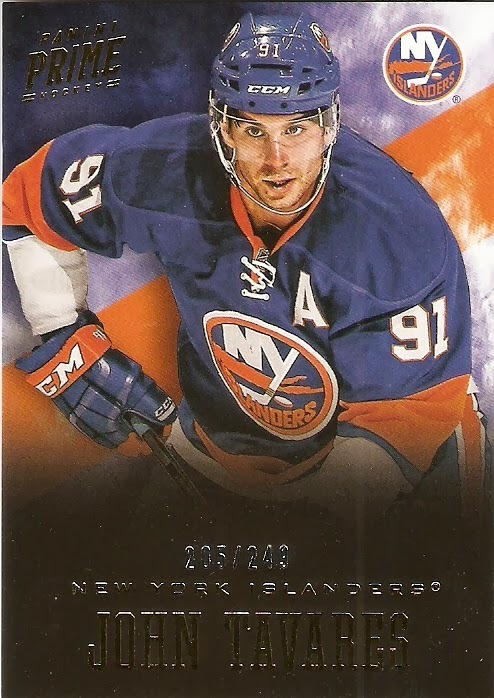 In a sometimes struggling New York Islanders team, he has been a big reason why they have been so successful, including putting a heavily-favored Pittsburgh Penguins team to the test in the 2013 NHL Playoffs. 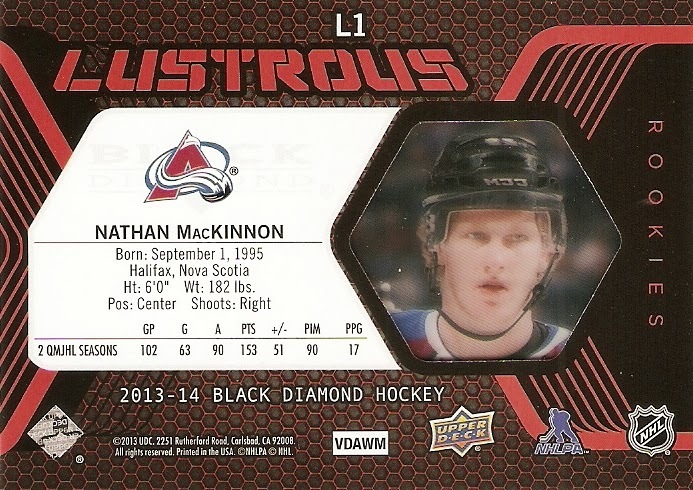 So, this card is pretty awesome. 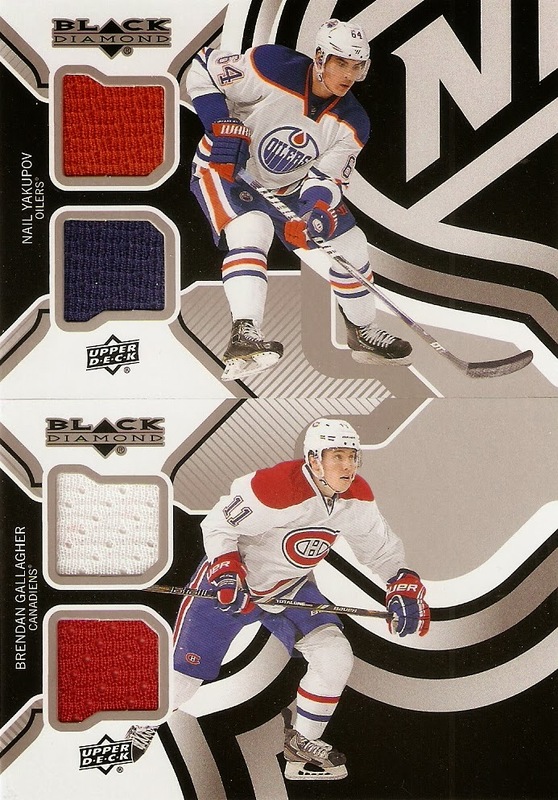 It contains two jersey swatches each of two of the greatest players in the NHL's history. The 1984 designation is not a George Orwell reference, though. It signifies their draft class, where Lemieux went No. 1 overall to Pittsburgh, and Roy was selected 51st overall by Montreal. The 1984 class was known for an unusually high amount of eventual Hall-of-Famers picked in later rounds, like Roy in the third, Brett Hull in the sixth (117th - Calgary Flames), and Luc Robitaille in the ninth (171st - Los Angeles Kings). Even though I'm not a huge Detroit Red Wings fan, but I love this card, which commemorates their 1997 Stanley Cup. 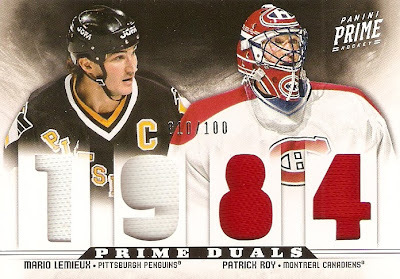 What makes this card really cool, too, is how heavy the star power is on this card, which just goes to show how loaded that team was. 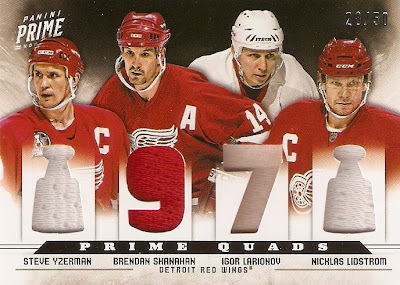 Yzerman, Shanahan, and Larionov are already Hockey Hall-of-Famers, and let's face it, Lidstrom's going in the very first year he's eligible. Other Hall-of-Famers on that team include Larry Murphy and Viacheslav Fetisov, who are currently in the HOF, as well as Sergei Fedorov and Chris Osgood, who will likely be inducted one day. 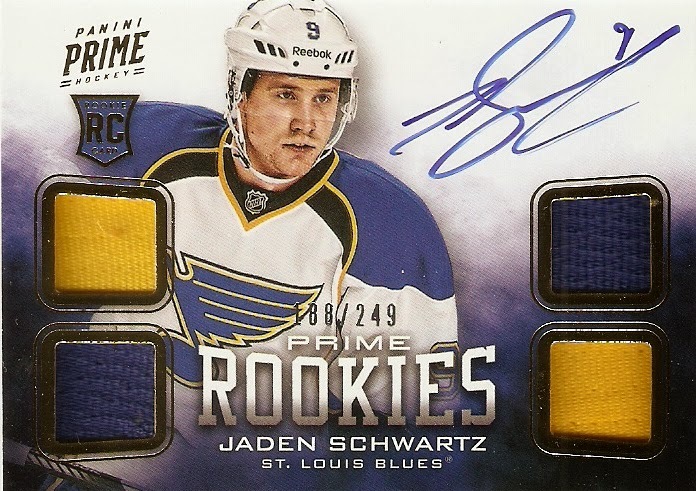 With a somewhat depleted rookie class due to the 2011 NHL lockout restrictions, the three hot rookies were Chris Kreider of the New York Rangers, Jaden Schwartz of the St. Louis Blues, and Sven Baertschi of the Calgary Flames. The 2012-13 hype had mostly to do with who was the most productive at the very end of the 2011-12 season. 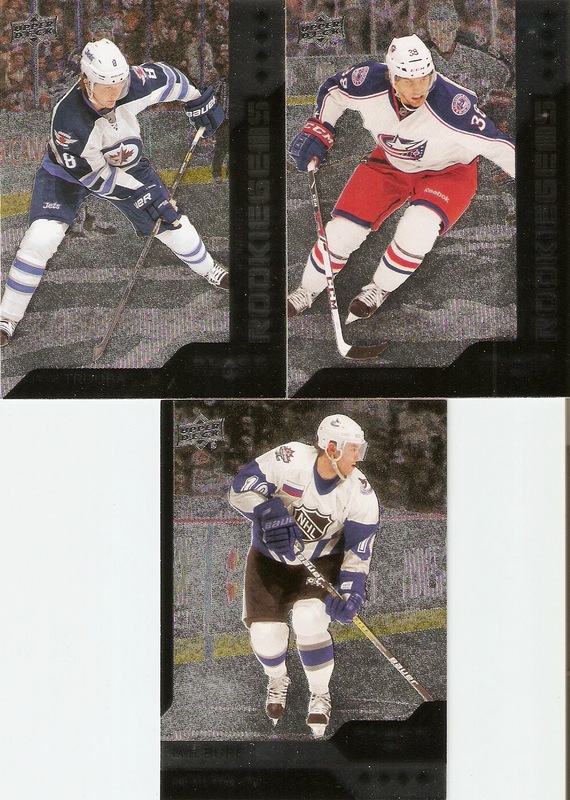 These players were in just a few games during that season, which is why they didn't get rookie cards that year, but in just seven games, Scwartz scored 2 goals and had 1 assist, which was enough to get on people's radar. It was also enough to get a permanent spot on the Blues roster the following season, where he played in 45 out of 48 games. 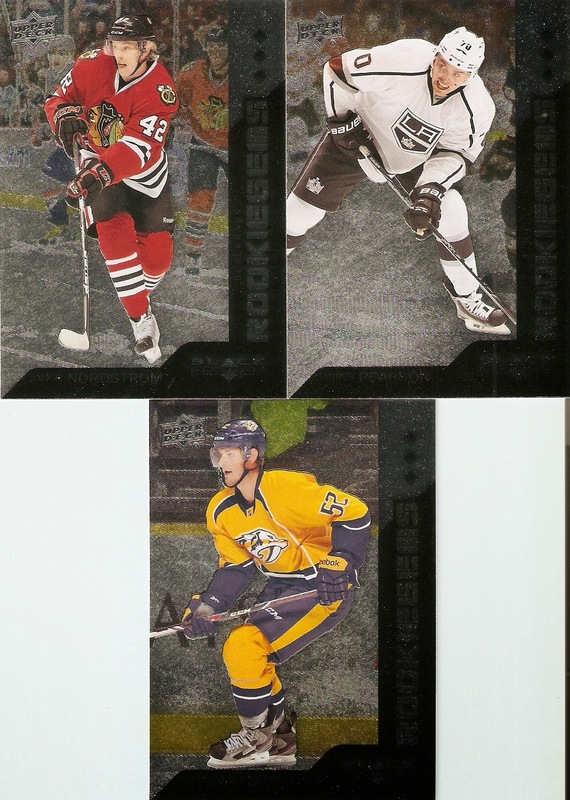 These may be "manufactured" relics, but still, they are just cool cards. The idea with these cards is to recreate a player's nameplate, and have them sign the individual letters. Of course, with 75, there's going to be plenty of repeats, especially with "A" and "E," which are repeated in his name to begin with. 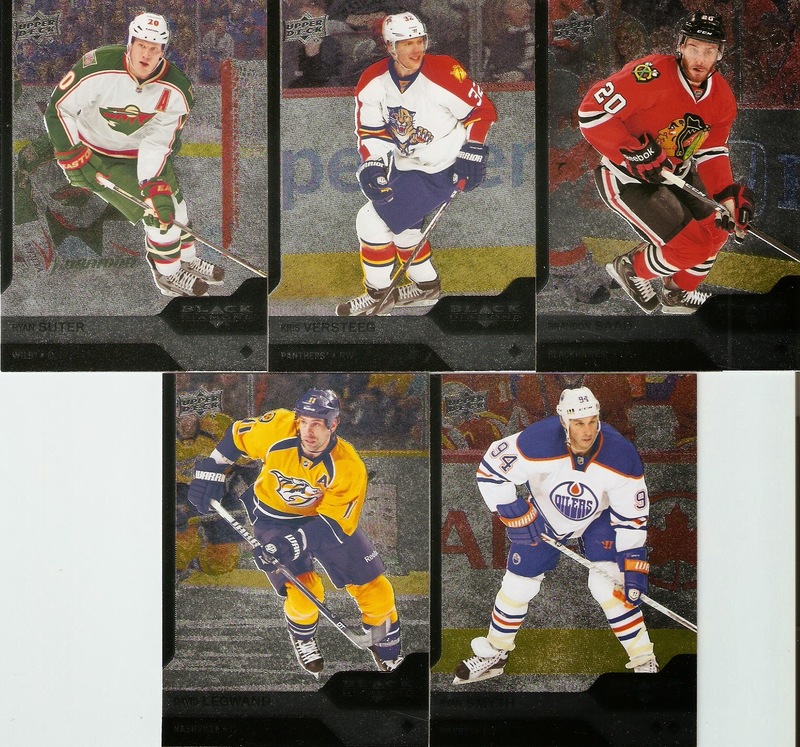 These cards really seem to work best with teams who just use one color for the letter. 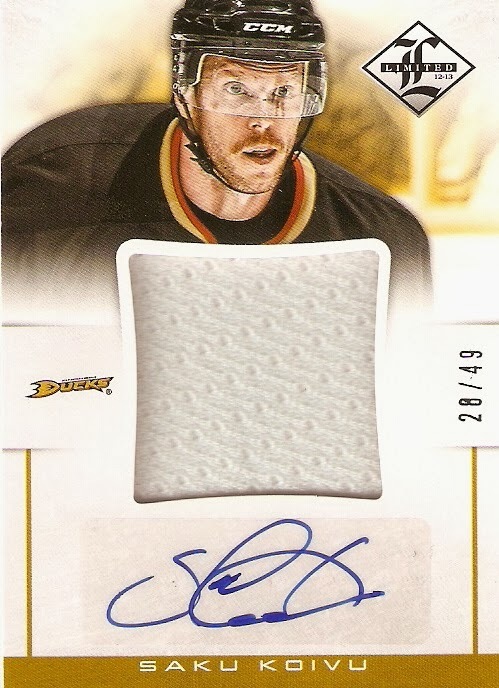 I purchased a Sidney Crosby Prime Namesakes card from the 2011-12 product, and with two colors being used for a border around the letter, there wasn't enough solid surface to sign on the letter, so he had to sign on the open space on the jersey material next to it. 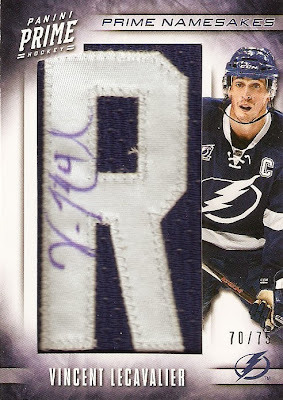 Either way, that doesn't matter, because this Lecavalier is a great looking card! Well, that's it for this box. I didn't get any monster pulls, like the Prime Ties card out of Box #1, or the Gordie Howe autograph out of Box #2, but that was still a pretty impressive break. 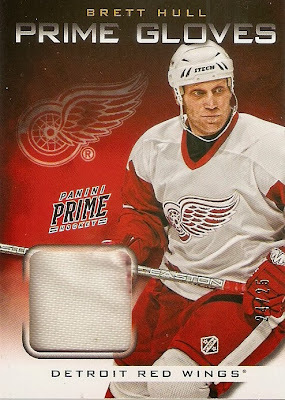 I'm really looking forward to 2013-14 Dominion coming out next week, but if that product doesn't quite measure up to expectations, I know that Prime will still take great care of me. 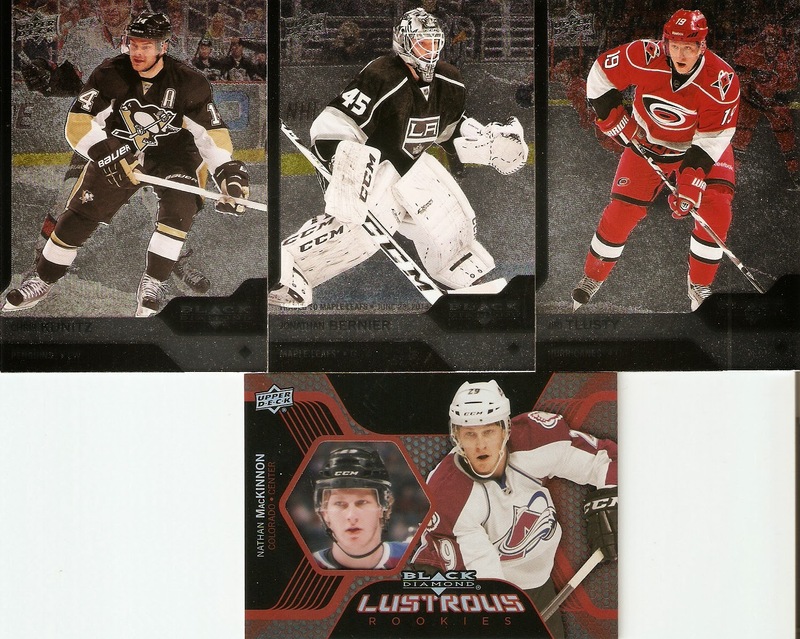 With a little bit of Christmas money to burn, I decided to pick up a box of 2013-14 Upper Deck Black Diamond. 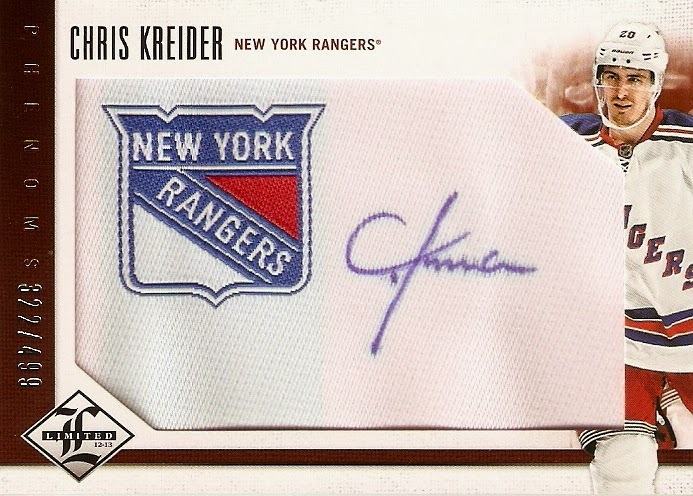 I purchased two boxes of this product last year, and ended up not only with two base sets, but loads of cool multiple jersey cards and really cool inserts. I was very happy with what I found from this box. While I was able to pull complete base sets (1-100) from each of my boxes last year, that wasn't the case with this year's product. 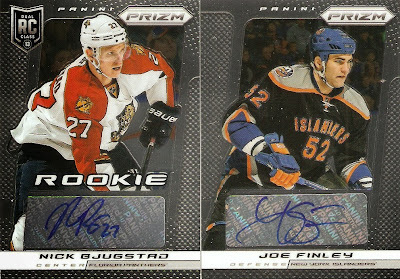 Still, I got some pretty good dual jersey cards, with both players being some of the hottest rookies from this year's double rookie class. 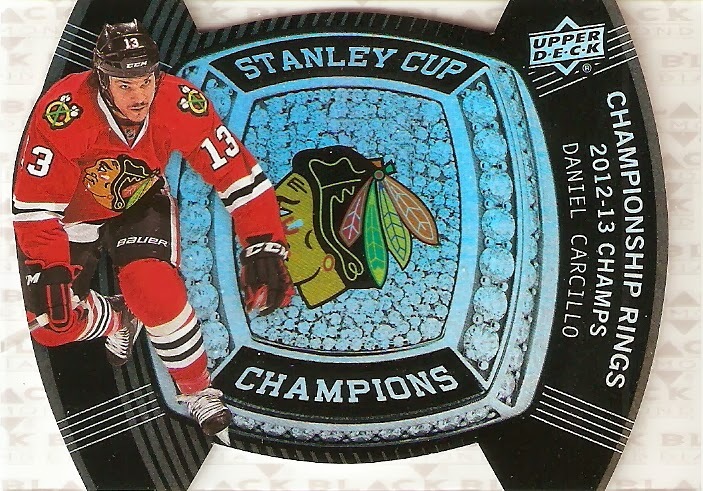 Plus, I got that FANTASTIC looking Championship rings card. 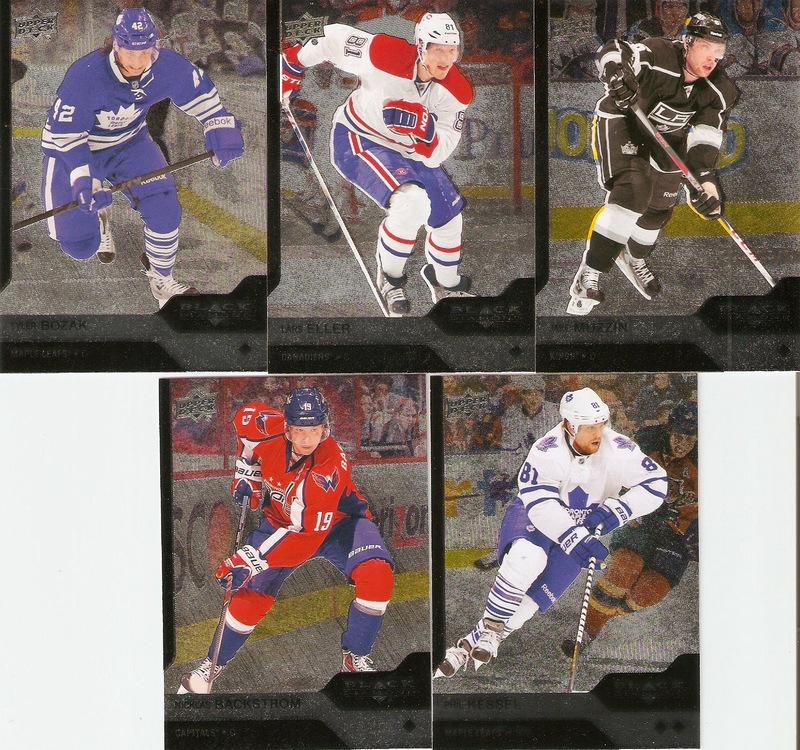 I pulled a Simon Gagne from last year's Black Diamond, and I think Upper Deck did a MUCH better job with this year's version. 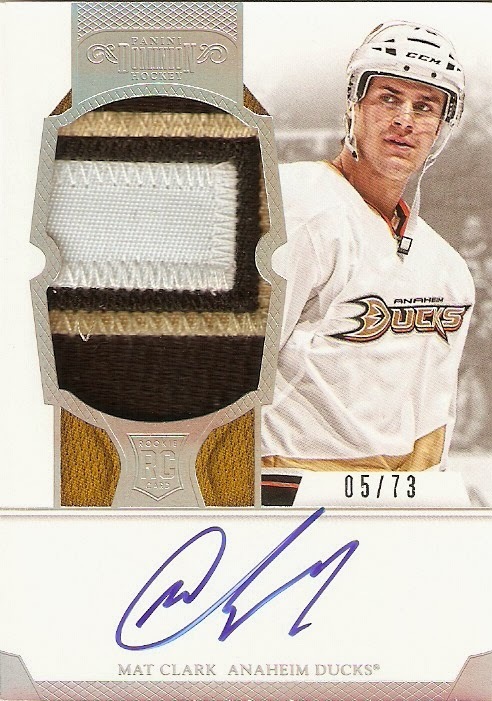 It keeps all the features that makes the card cool, but it makes the ring bigger and brighter, and slaps it down right on the front of the card. Black Diamond is affordable, gives you a good value, and gives you a few bonuses that are sure to impress. If you're looking for a fun box to open, I would definitely give this one a shot. Hopefully, everyone had a great Christmas. Mine was fantastic. I spent time with family, ate some great food, and got some cool presents. I even got some cool sports-related gifts from the parents. Now, I know most of these gifts would work for a 15-year-old, but even at 33, they still work for me. I guess I'll never grow up. First off, my folks got me an Edmonton Oilers replica jersey. 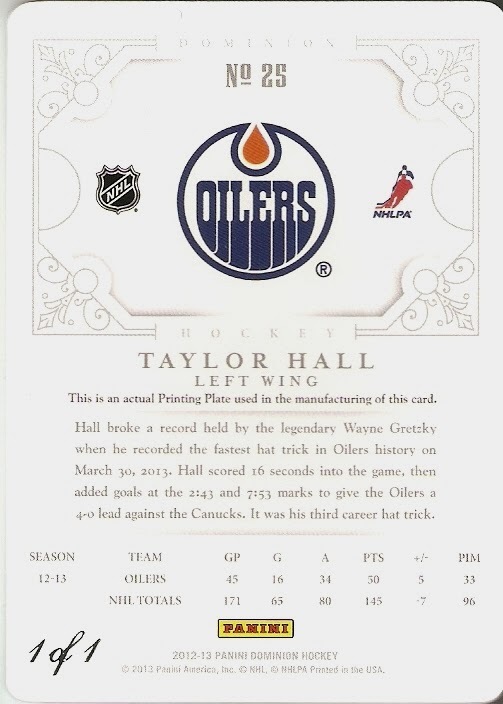 I know I'm a Penguins guy, but my dad is working up in Edmonton right now, so when they asked for gift ideas, Edmonton Oilers stuff was the first thing that came to mind. 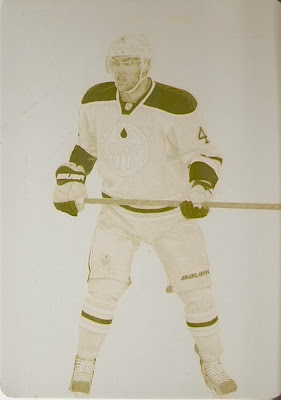 Not only is it a jersey, though, but a throwback, as it is the version that the team wore from 1979-1996. VERY cool. My other Oilers gift was a set of four coasters. These came in a hockey puck case, because they are shaped exactly like a hockey puck. Each of the black rubber discs contain an Oilers theme, and the sides of the coasters have a rough surface, just like an actual hockey puck. They are a bit smaller in circumference than most coasters are, but they are the perfect size for holding a bottle of Labatt Blue. Lastly, also from my parents, I also got a Willie Stargell McFarlane Sportspicks figure. While the Chicago Cubs are my baseball team, I love old-timey baseball of any kind, but the real reason my dad picked it out for me, was simply because he found it for a good price at a garage sale. It will soon be freed from its plastic prison and placed right next to my other baseball McFarlanes. Well, that's it. I'm not sure if anyone else cares about any of this stuff, but I think it's pretty cool. Third out of three from the group of Peerless Patches cards I purchased last month, is the one I came in for in the first place. 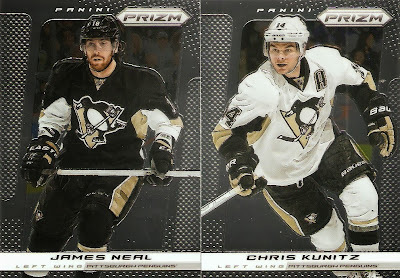 This one is of James Neal, and is numbered 22/40. The card features a sweet-looking patch from the team's previous third jersey. It most likely comes from the "N" on the bottom of the jersey crest. I know I've written about Neal before on many different occassions, and specifically, how awesome he is statistically. Here's a new perspective, though. Neal was the third round pick of my fantasy hockey team, Moves Like Jagr, but despite being a third-round pick, my season seems to be living or dying based on whether or not Neal plays. During the first part of the year, with him out injured, I didn't win one single week. Then he came back, and I started finally lighting up the scoreboard. Now, while he was out for a week and a half with a suspension, it's back to the basement again. Hopefully with him back in the lineup, I can finally get myself a few more wins. 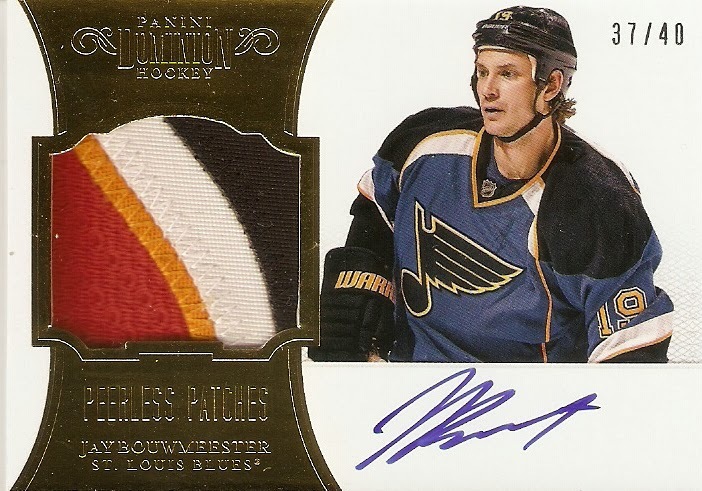 Bouwmeester was acquired by the St. Louis Blues at the 2013 trade deadline in a deal that sent goaltender Reto Berra and a first round draft pick to the Calgary Flames. He has been regarded as a top NHL defenseman ever since his draft year of 2002, where he was selected third overall by the Florida Panthers, behind Rick Nash (1st, Columbus Blue Jackets) and Kari Lehtonen (2nd, Atlanta Thrashers). What I really like about this card is how quickly they were able to capture a photo of Bouwmeester in his new uniform. Even though the patch is from a Calgary Flames sweater, I can overlook that, due to the lack of time available to acquire a Blues jersey. Zucker is one of the 2012-13 rookies to make it to the Peerless Patches set. He played in just six games during the 2011-12 season, but made it up for 20 during the following year, scoring four goals and one assist. This season, he has been going back and forth between Minnesota and the AHL's Iowa Wild. 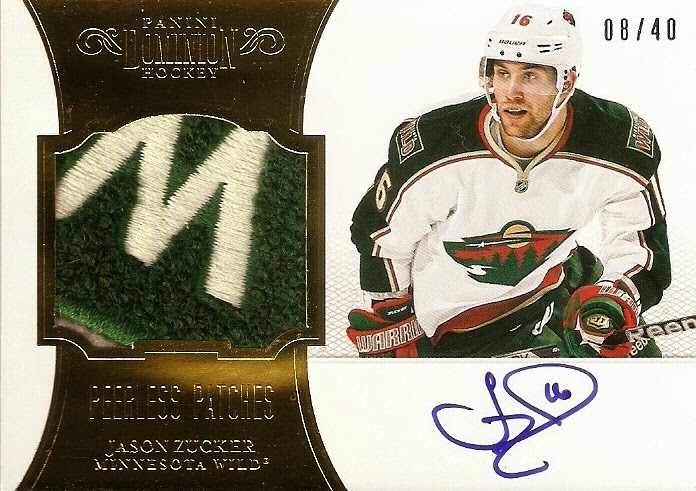 So far, Zucker has played 7 games in Minnesota this season, but is currently playing in the AHL. Here's a card I bought, simply for the fact that I figured it would be a good idea to have an autograph of his: a 2011-12 Ultimate Collection Logan Couture Ultimate Signatures card. A ninth overall draft pick by the San Jose Sharks in 2007, Couture figures to be a big part of San Jose's future. 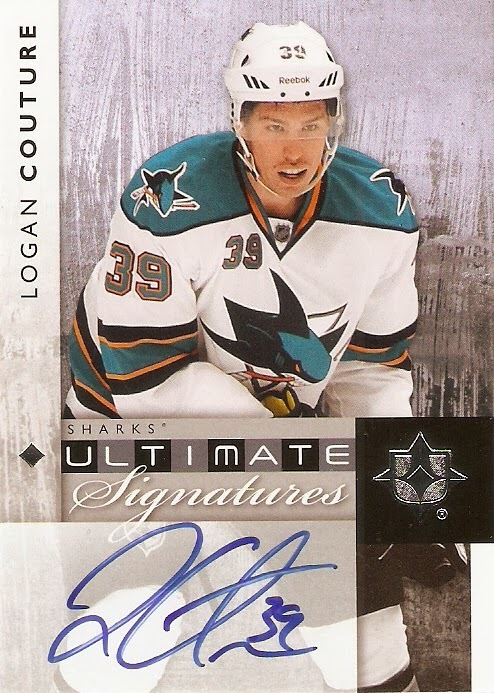 Couture has made an impact in each of his NHL seasons, but he really made his presence felt in the lockout-shortened 2012-13 season, playing in all 48 regular season games and 11 playoff games. During tyhat season, Couture led the team in goals (21), game-winning goals (5), shots (151), and power play goals (7). Sam Houston State University doesn't really have enough alumni in the NFL to start a collection, but on the rare occurance that someone makes it to the show, I like to grab up a few of his cards. 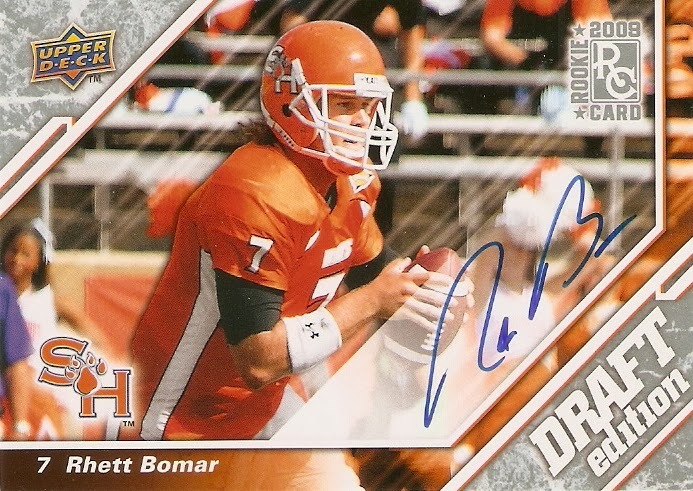 My most recent SHSU cardboard purchase was an autographed Rhett Bomar card from 2009 Upper Deck NFL Draft Edition. fact that he is featured in his Bearkats orange and white, with the SHSU logo proudly displayed on the bottom left of the card. After lighting it up in college, Bomar was selected in the fifth round by the New York Giants in the 2009 NFL Draft. Unfortunately, Bomar never made it into an NFL game, serving mostly on practice squads for the Giants, Minnesota Vikings, and Oakland Raiders. 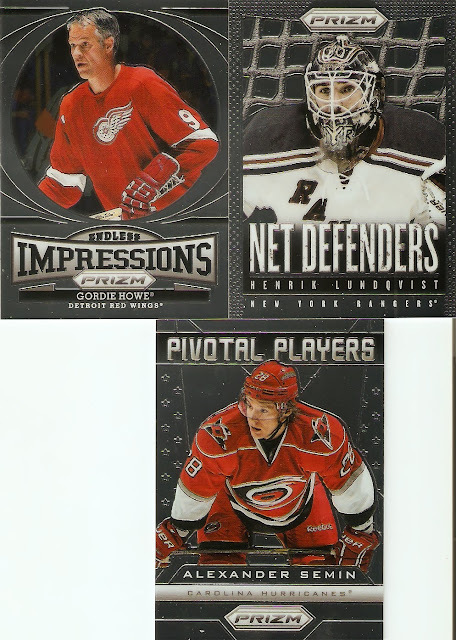 I participated in a three-box break of 2013 Totally Certified football that I had bought into on Ebay. I picked my Texans and was just hoping that I would luck out with something. I ended up with just one card, but it ended up being a hit, specifically, a Ray Graham Freshman Phenoms card, numbered 104/499. While it was a hit, unfortunately, it wasn't much of a hit. 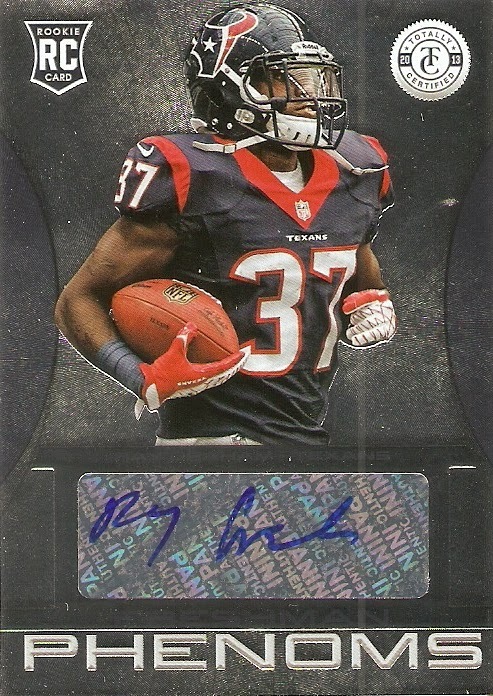 Graham was an undrafted free-agent signee of the Houston Texans in April, but was released from the team in August. Three months later, he was signed by the Pittsburgh Steelers, and is currently assigned to their practice squad. 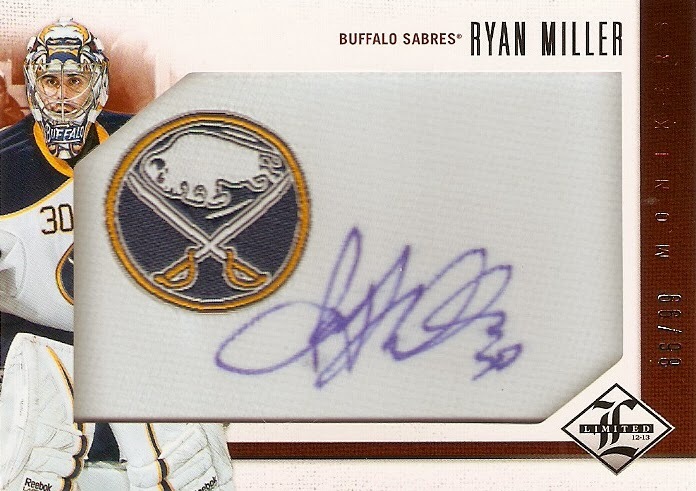 After seeing a cool Phil Kessel autograph I wanted on The Real DFG blog, I set in motion a trade that got this fantastic piece of cardboard in my hands. 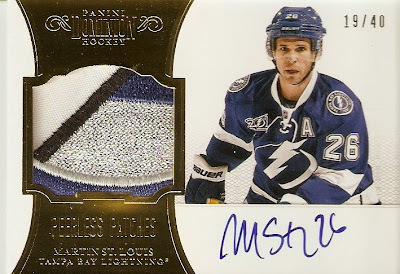 This one comes from 2012-13 Panini Limited Monikers, and is the silver parallel, numbered 16/49. 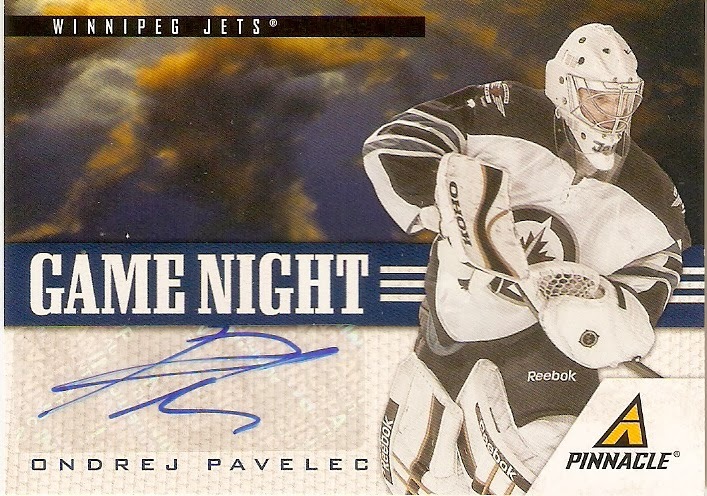 It being the silver version, it features the team's alternate logo, instead of the base version. 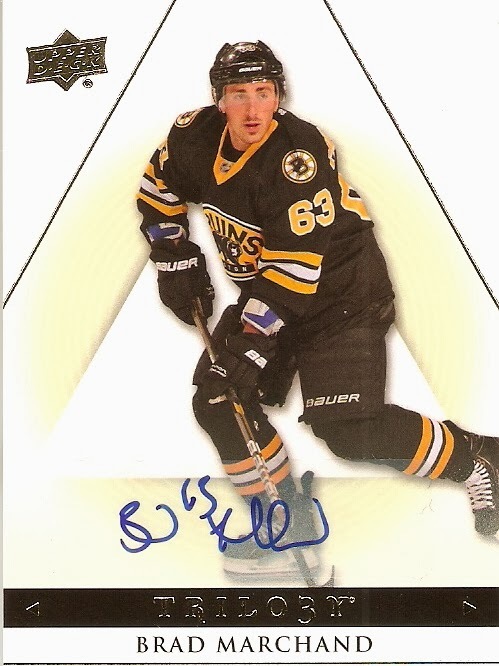 While I am not a particularly big Maple Leafs fan, I always figure it will be a good idea to get my hands on an auto of such a good player, if such an opportunity comes. What I was not expecting, though, was the INSANE amount of set-building help that was included along with the Kessel. 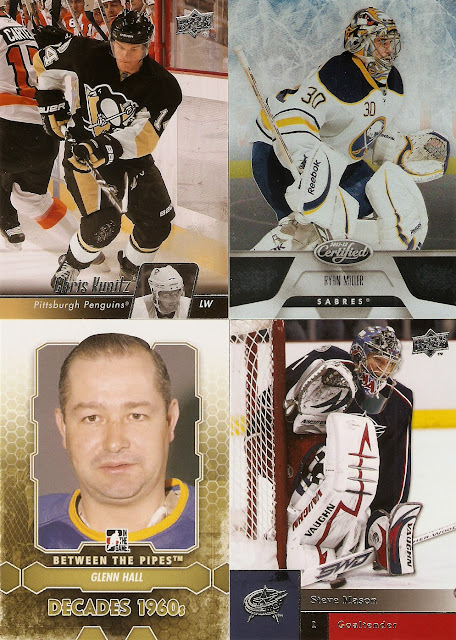 In total, Tim sent me 90 cards to help build a few sets I am currently working on from four different sets. 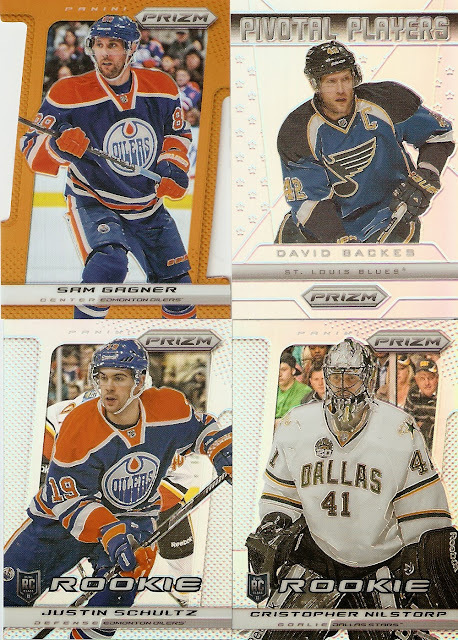 I got 59 cards from 2013-14 Prizm, 3 cards from 2013-14 Artifacts, 9 cards from 2013-14 Select, and 19 cards from 2013-14 Upper Deck. Thanks for a great trade, and I look forward to our next one. 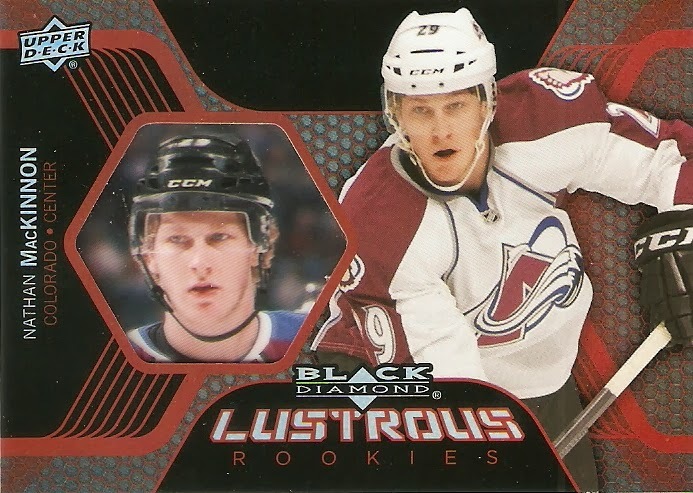 Okay, since I know I have some impending car repairs, which will no doubt set me back quite a bit of funds that would otherwise be used for cards, I had to settle for four packs of 2013-14 Upper Deck Black Diamond, instead of a full box. Still, despite having to trim down my budget, this experience proves that sometimes you don't have to break the bank to get one of the cards you really want. Insert sets like these just go to show that you don't always have to pull the guaranteed hits to find something amazing. 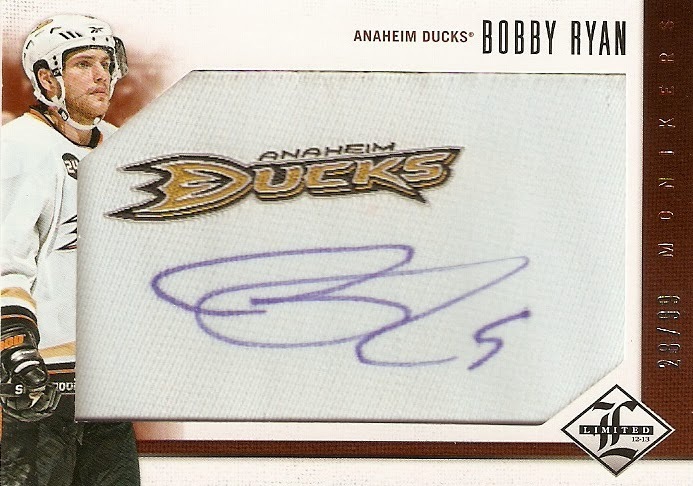 Not so recently, I picked up a significant lot of autographs, patches, and other memorabilia cards, but just haven't had the time to get them posted. I got some REALLY good cards, for a total price of about $64 shipped, which is pretty impressive, considering some of the pieces I acquired. There you have it. 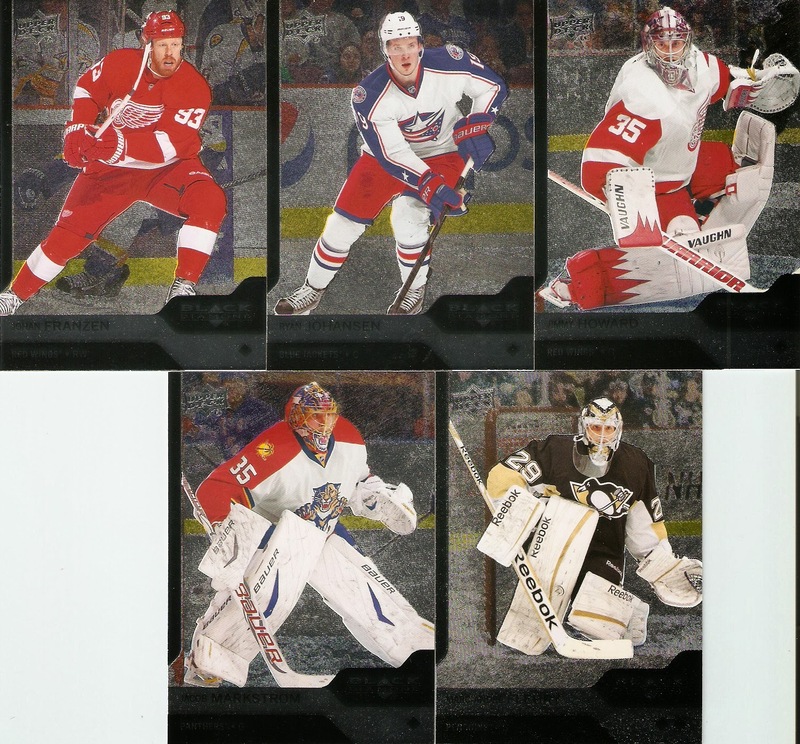 I'll be keeping the Crosby, Hull, Miller, and St. Louis, but any of the others are up for trade, so let me know if you are interested. Hey Topps, What the Hell?? ?